When buying a used car, its always in your best interests to have the vehicle inspected by a qualified auto mechanic before signing on the dotted line. In some situations, such as if you plan to purchase a car from an auction, a professional auto inspector isn’t an option. While there is no surefire way to avoid accidentally buying a lemon, there are warning signs you can look for when conducting your self-inspection on the vehicle that will save you from making a costly buying mistake. Checking a used car’s oil before buying it seems like a no-brainer, but thousands of consumers neglect to do this. Clean engine oil does not guarantee that a used car has been well-maintained by the previous owners, but low oil levels, dark, gunk-filled oil or oil with white flecks in it guarantees that it hasn’t. Oil problems are a warning sign that could indicate further engine trouble. Thus, checking the condition of the car’s engine oil should be your first step. Also look beneath the vehicle and under the hood for evidence of an oil leak. Oil leaks don’t improve – they get worse over time. You don’t have to be an auto mechanic to recognize major engine problems through a self-inspection. Start the car and open the hood. Listen closely for any engine sounds that indicate trouble, such as knocking, clicking, rattling, or grinding. With the engine running, step around to the rear of the car and look for smoke coming out of the tailpipe. Black smoke from the tailpipe isn’t a sign you want to see. In cold weather, it’s normal to see steam exiting the tailpipe upon starting the car. Black smoke, however, indicates the car is burning more fuel than normal and could suffer from engine trouble. A transmission can easily be one of the most expensive car repairs you’ll ever make. Many individuals opt to purchase a new car rather than replace a faulty transmission. Save yourself the trouble by knowing signs of transmission trouble before buying a used car. If the car has an automatic transmission, checking the transmission fluid levels is as simple as removing the transmission fluid dipstick, wiping it clean, reinserting it into the engine housing and checking the fluid levels. Low or dirty transmission fluid may indicate future problems for the transmission. That does not mean, however, that the car’s transmission is not in good working order. If you opt to purchase the vehicle, have the transmission fluid and filter immediately changed. For cars with mileage over 75,000, don’t be tempted to purchase a “flush.” A transmission flush, while safe when performed on vehicles without build-up, can easily leave thick deposits on other internal parts – adversely affecting the vehicle’s performance. Turn the radio and air/heat off in order to better listen to the car’s internal parts. Drive the car at low and high speeds. Take multiple turns to check the vehicle’s handling. Listen for engine noises you may not have noticed while the car was idling. Pay close attention to how the car shifts. Trouble shifting may indicate transmission problems. 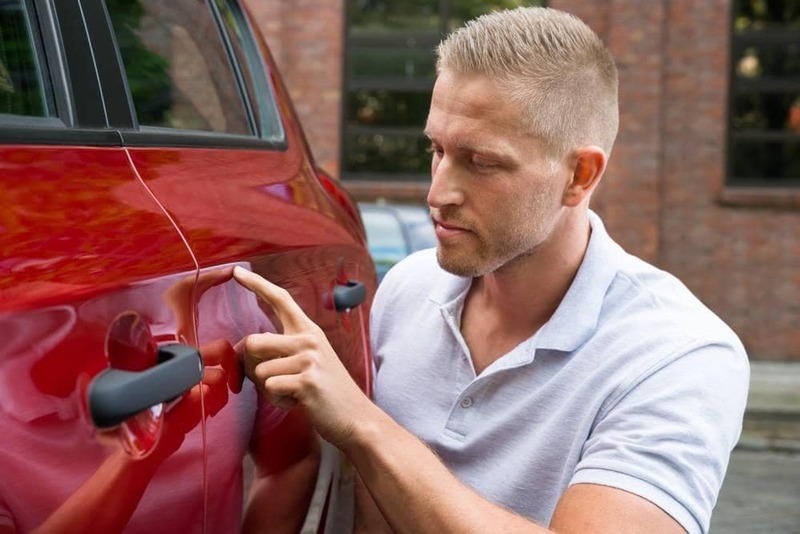 Although a used car’s damaged interior isn’t as pressing a repair issue as damaged internal parts, it’s still a good idea to make sure everything is in good working order before your purchase the vehicle. You certainly don’t want to drive up to a fast-food window on your way home only to discover that the car’s power windows don’t work. Make sure the “Check Engine” light isn’t on. Use the locks. Make sure they’re functional. Look under the mats for holes or carpet stains. Make sure the glove box works. If locked, make sure the current owner has the key. Check the seats for holes or tears. Make sure the radio works. Run the heat and air conditioning to ensure that both are functional. If the car doesn’t pass your self-inspection, you can rest assured that it wouldn’t pass an inspection with a qualified auto mechanic. If an auto mechanic is available to inspect the vehicle yet the owner or dealer will not permit you to have the used car inspected, that in itself is a more significant red flag than anything you could find when conducting a self-inspection. Save your money for a vehicle that passes your reliability inspection and, if possible, your mechanic’s as well.